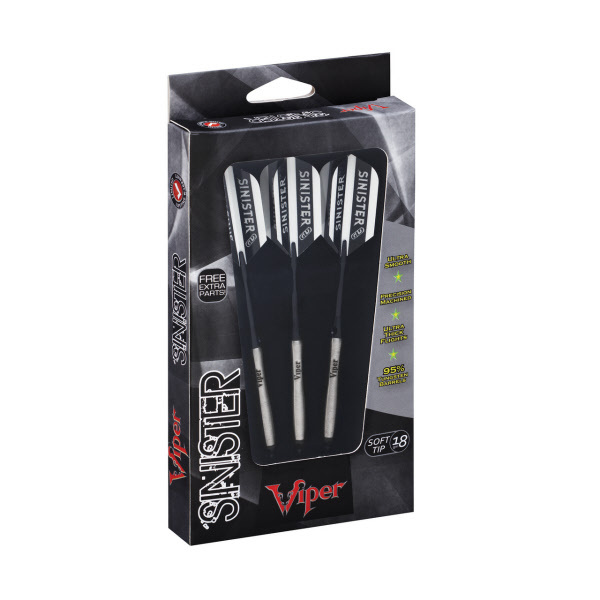 Take your game from casual to pro with the Viper Sinister Soft Tip Darts, designed for use with either electronic dart boards or most sisal dart boards. 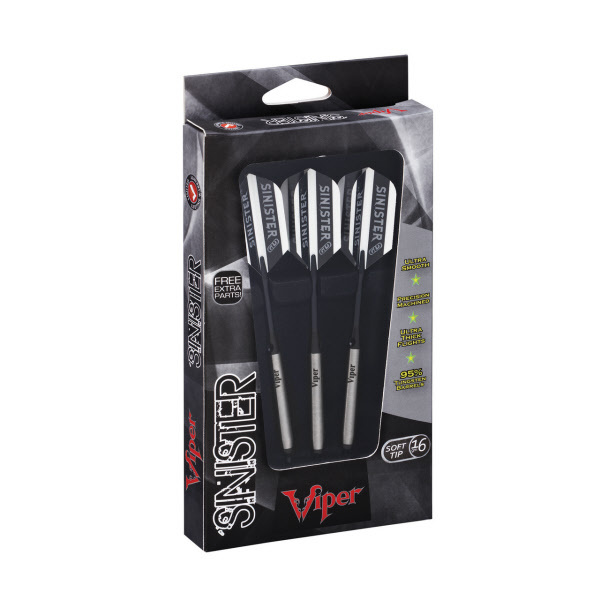 These darts are packed with features starting with the barrel, fashioned from 95% Tungsten and 5% Nickel. Tungsten is a very dense metal, able to create slimmer darts with the same weight as lighter metals; this allows for tighter shot groupings without sacrificing control, increasing your scores. Tungsten is a sign of quality and durability as well because of its density. A higher tungsten content will produce a slimmer dart profile than one with less. More tungsten in the dart increases the price as tungsten is a rare metal and its density takes more effort to machine. The increased price gives a higher quality barrel and can improve performance, increasing scores. 95% Tungsten barrels are some of the highest density dart barrels you will find, allowing the slimmest profile dart available. The Sinister Darts feature tough, 100 micron flights. The extra hardiness these flights feature means that you won’t need to replace them as often – they’ll stand up to the toughest throws. Each dart is precision machined for maximum aerodynamics and a sleek, smooth look. Finally each set includes six high speed slim flights, three extra nylon shafts, six 2BA Tufflex II Tips, and a dart mechanic repair tool.